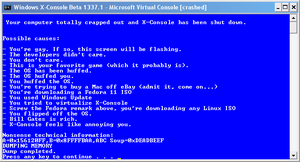 Windows X-Console is a new operating system by Microsoft, which takes you back way to the DOS days. Beta 1337 of Windows X-Console running in Microsoft Virtual Console. As you can see, it has truly amazing compatibility. Yep, it looks ugly. Yeah, it's your favorite game. 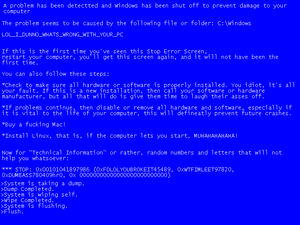 BSOD v3.0 has come to Windows X-Console! ...succeeded! This was how Windows X-Console was born. The developers remembered that Key-to-the-gates (as Bill Gates was nicknamed) told them to make an OS with the power of Windows. This also means the stability of Windows. Since this is our favorite Windows game for everyone (even the developers), they decided to implement it in Windows X-Console too! Trap error: Process bsod.exe crashed! Please call Microsoft Technical Support and provide the information above. Therefore, Microsoft released Windows X-Console Beta 1337.2 and BSOD v3.1 Standard Edition as critical updates. These updates fixed the crashing bug by making BSoD start as soon as drivers are initalized (unless the user booted in safe mode by pressing F8+666+Windows+Alt+Ctrl+Delete+1+2+3+4+5+7+8+9+*+/+-+z+x+c+b+?+=+Apple+Command). Bill Gates realized he had to do SOMETHING - his users were starting to get bored of the technical info on BSOD. So, his development team released BSOD 4.0! This page was last edited on 3 September 2012, at 08:30.